I spoke to some of the folks involved in the Hack tests way back. Even then, the LCA's RCS was remarked as being quite low. Furthermore, with the kind of jammers we are developing, from the MiG-29, Jaguar, Su-30 MKI - all aircraft which are, to put it mildly designed for high RCS aircraft, we clearly will have the capability to design one for the LCA as well, apart from the options we have off the shelf/international market and even in-house. Today I watched Dr Anantha Krishnan,s interview with Dr Kota. he undoubtedly is one of mother India,s great sons. it made me very sad that one year after this interview there are a measly 2ooo odd people who watched it. While a third rate bollywood song gets 500 million hits while the man who helped India take a giant step towards becoming a aerospace power gets little recognition.if someone missed this great interview here is the link. WAG on RCS: Abhi on a Tejas would have shot all the F-16s before they could scramble him for a BVR shot (by at least 2.5 to 5 times faster than they could detect Tejas). F-16 is around 1.2 (block c++) to 5 (old blocks) m^2 RCS. F22/35 are the ONLY fighter jets Tejas might find difficult to engage now. ^ Wing Co. Abhi used a R-73 it was being queued via his HMS , RCS is no longer in picture during this phase however yes prior getting that close the guy who has a lower RCS will have some advantage depending on the difference in RCS of the two AC and obviously Radars aiding them (onboard or otherwise) , I think what Wing Co. managed to pull off is an immense feat because F-16 has a more powerful radar than the Bison so some of the advantage in being smaller is negated . negi wrote: ^ Wing Co. Abhi used a R-73 it was being queued via his HMS , RCS is no longer in picture during this phase however yes prior getting that close the guy who has a lower RCS will have some advantage depending on the difference in RCS of the two AC and obviously Radars aiding them (onboard or otherwise) , I think what Wing Co. managed to pull off is an immense feat because F-16 has a more powerful radar than the Bison so some of the advantage in being smaller is negated . WingCo Abhinandan's formation used the mountains to avoid radar detection at long range. Once he had got close enough to fire the R-73, there is no way to avoid radar detection (from the other F-16's in the formation which might be behind him). Even an F-22 can probably be tracked on radar at that range. Suresh S wrote: Today I watched Dr Anantha Krishnan,s interview with Dr Kota. he undoubtedly is one of mother India,s great sons. it made me very sad that one year after this interview there are a measly 2ooo odd people who watched it. While a third rate bollywood song gets 500 million hits while the man who helped India take a giant step towards becoming a aerospace power gets little recognition.if someone missed this great interview here is the link. Well, you can add one more person who watched the interview and was very touched. One thing I want to comment on is how lucky many Indian institutions like ISRO, ADA, IISc and others have been to be influenced by some of our greatest people like Satish Dhawan, Abdul Kalam and others. I feel that this influence at an early stage was crucial to them becoming what they are today. I would also like to highlight the vision of another of India's great people, Tatan Tata. The IISc started as the Tata Institute and the fact that Ratan Tata was willing to adopt the LCA program if the government canceled it was probably the crucial thing that saved the LCA program. karanM, Maybe they need to coat those moving surfaces with Molybdenum Sulfide or PTFE coating to reduce friction and wear. RonyKJ wrote: Ratan Tata was willing to adopt the LCA program if the government canceled it was probably the crucial thing that saved the LCA program. 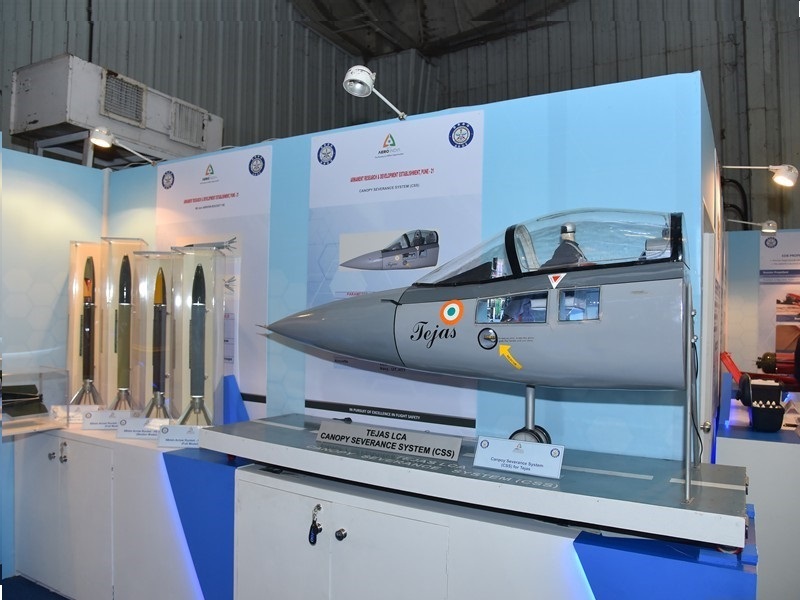 Found this image on ADA's website from Aero India 2019. The canopy severance system has been modified it appears, with the new explosive cord embedded not just on the top of the canopy but also all along the sides. The tejas.gov.in links (on first page of this thread) say "Account suspended". What a pity!! Russia is India's ally. America is India's ally. France is India's ally. Israel is India's ally. But is India its own ally? Stumbled across this on teetar. How time flies! 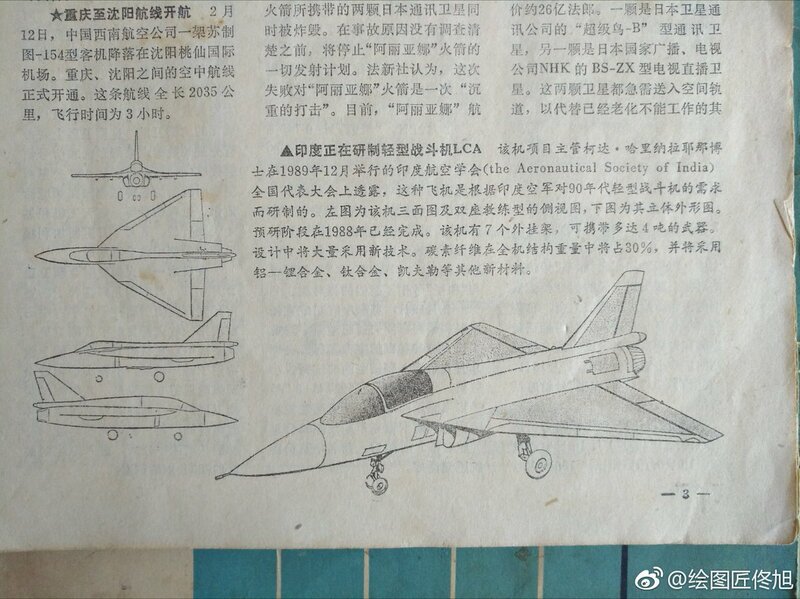 There was a piece on the corner of Aerospace Knowledge magazine issued in April 1990 introducing the Indian LCA project with illustrations, which said the pre research had completed in 1988, lots of new techs would be used in the design. gaurav.p wrote: Stumbled across this on teetar. ▲India is developing the light fighter LCA. The project leader Kodak, Harina Lajnabo held the Indian Aeronautical Society in December 1989. The National Congress of the Aeronautical Society of India revealed that the aircraft was developed in response to the Indian Air Force's demand for light fighters in the 1990s. The picture on the left is a side view of the machine's three-sided and two-seat trainer. The picture below is a three-dimensional shape. The pre-research phase was completed in 1988. The aircraft has seven pylons that can carry up to 4 tons of weapons, and a large number of new technologies will be used in the design. Carbon fiber will account for 30% of the total structural weight, aluminum-lithium, titanium alloy, Kevlar and other materials. Ot anyway..but the bengali didi is going to get it after the elections..
Really happy to see this news on Dynamitic. But the speed of implementation is slower than I expected. Anyhow god speed to them. The jig says "LCA-4001 Front Fuselage Jig". Interesting number. The SPs start with 5001. What can 4001 possibly mean..? gurav_p and M_joshi, thank you for sharing this nugget of info and translation. Interestingly it says 4T payload. I wonder why ADA had been publicizing 3.5T all these years. JayS wrote: Really happy to see this news on Dynamitic. But the speed of implementation is slower than I expected. Anyhow god speed to them. Supratik wrote: Tejas clears Malaysian RF! stage. I am curious whom the Malaysian Air Force fighters are intended to fight. Singapore? Probably not. China? Most likely yes. So how do the JF-17s make sense to deter China? jamwal wrote: Haven't seen any single source confirming that LCA has bigger RCS than Mig-21. It's not possible technically anyway. At least side on, LCA is bound to be far stealthier than any other plane in IAF inventory. The tail fin is a co-cured, co-bonded composite, totally transparent to radar. JayS wrote: Interestingly it says 4T payload. I wonder why ADA had been publicizing 3.5T all these years. Because empty weight increased by 500Kg (from 6T to 6.5T) reducing payload for same MTOW. Before 2008 I remember ADA posters mentioning 4T. Dynamatic Technologies Limited launched ,‘TEJAS MAIN FUSELAGE ASSEMBLY’ for Hindustan Aeronautics Limited (HAL). This program was inaugurated by Dr. Ajay Kumar, Secretary (Defence Production), Government of India, in presence of Mr. R Madhavan, Chairman & Managing Director, HAL. 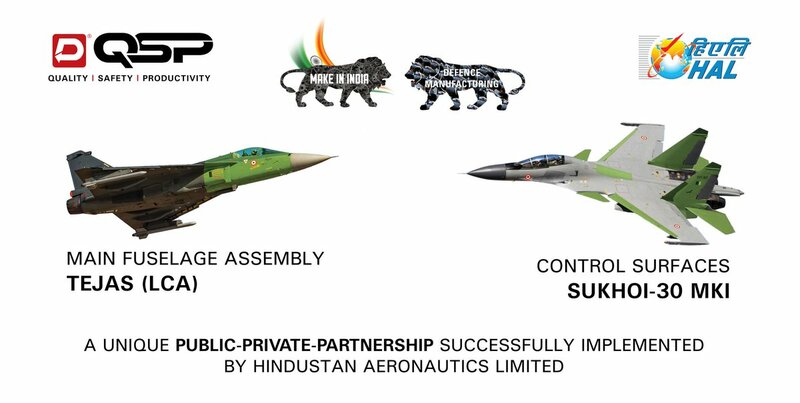 This is a milestone in our Nation’s Aerospace journey and Make-in-India initiative, a unique Public-Private-Partnership successfully implemented in association with HAL. sudeepj wrote: ... co-cured, co-bonded composite, totally transparent to radar. Can you please explain this statement further? Or give some links that we can read up on. What he means is that there are not rivets or other metallic fasteners used to join the internal structures & skin together. They are joined using adhesive bonding or for some components, they are cured together in an autoclave & hence come out as one. No to very little metallic parts means very little radio waves reflections as composites are supposed to be radio transparent (I gotta read up on this further). But I do think there will be some metallic parts inside the VT assembly. Since the VT is used to house a movable rudder, there will be components like hinge line rod, rod bearings housing, actuators & other stuffs which will contribute to some reflections. Zynda wrote: What he means is that there are not rivets or other metallic fasteners used to join the internal structures & skin together. They are joined using adhesive bonding or for some components, they are cured together in an autoclave & hence come out as one. No to very little metallic parts means very little radio waves reflections as composites are supposed to be radio transparent (I gotta read up on this further). Except for the Radome, every other part of the surface of the aircraft is "metalized. This is done for static discharge and lighting protection. Infact even on so called stealth aircrafts, the skin absolutely has to be radio reflective or absorbent but never transparent as any transparency would give away the reflection from metallic parts inside the aircraft which would render all the shaping useless. I was talking to one of the experts from DLJ and she was very categorical when she said radio transparency is a bigger headache and that she preferred an all metallic aircraft for better RCS. Interesting work being done by these guys! I wonder if some of the composite work being done for LCA-Tejas can be ported to Su-30MKI to reduce it's radar signature. One more thing occurred to me: if the internals are not shielded, then they are vulnerable to RF interference and hence, electronic attack. Actually, it is Singapore. Singapore was once part of Malaysia. In fact, Singapore is a bit like Israel as an infidel speck in a sea of muslims. Both are huge trade partners with Cheen and are unlikely to fight it. Their main rivalry is historically with each other. raghuk wrote: I was talking to one of the experts from DLJ and she was very categorical when she said radio transparency is a bigger headache and that she preferred an all metallic aircraft for better RCS. It would make sense. A reason why we see peculiar solutions for cockpit, landing gears bay and weapon bays in 5G jets. The Japanese have invested time and effort to design internal weapon doors with the fastest closing time! This also means we need specific solution for throwing out the weapons from the weapon bay before the door closes! And you cannot have hot launch of missile inside the bay! Peculiar engineering problems in 5G jets. One of the prime reason I am not keen on LCA to Malaysia. One you don't want to p**s off our true ally in the region and more important don't want to see LCA been shot down by F15SG/F35 is the balloon goes up! Either ways it is loss loss. Not sure if others remember this. But two decades ago, Cheen actually asked to be part of the LCA project. This plea was real and was in their Global Times or whatever media.